I was going through my personal email this morning, which is usually filled with store ads. One had a necklace called the “Tree of Life”. 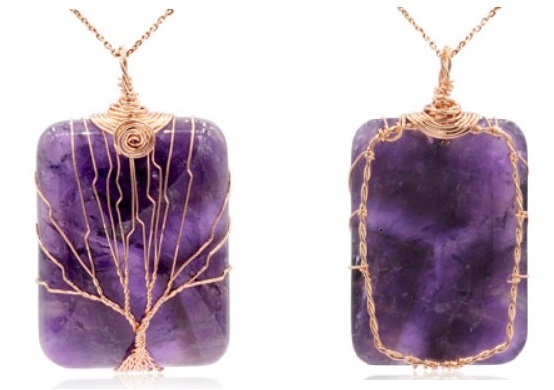 It was a pretty thing, with a gemstone wrapped in wire in the shape of a tree. On the back the wire was wrapped in an endless circle. God speaks through my email, I supposeJ, because he had a lot to say about this. For many, the tree of life fades into the background of what they know of trees in the Garden of Eden. There were two significant trees in the original home of mankind. The Tree of Life showed God’s love to us, and the Tree of the Knowledge of Good and Evil shows our love of God. Our love of God should have made us obedient. But as we all know, we failed that test – big time! When Eve and Adam rebelled against God’s command not to eat of the Tree of the Knowledge of Good and Evil, they brought evil into the world. In a perfect world that was sin free - except for satan and his demons - they started a rebellion against God’s will. On the surface, that may not look like a tree that shows God’s love to us. But consider what would have happened if we had lived forever with sin. Eating of the Tree of Life would have given us the ability to “live forever”. But – we would have lived with sin – and sin would have abounded! Since God has no fellowship with sin, we would have lived without God. Imagine a world where we were all left to our own sin, a world where depravity and evil reign freely. A world where justice, mercy, and love were nowhere to be found. Friends, the world is a sinful place today, but we cannot even grasp what it would be like without God the Father, God the Son, and God the Holy Spirit. The Tree of Life was taken from us out of God’s endless love for us. He placed a flames around it to keep us from the tree so that we would have the ability to die, and not live forever. But God did not stop there. Through Jesus, He gives us back the ability to live forever. John 3:16 clearly states how that can happen to you: “For God so loved the world that He gave His only begotten Son, that whoever believes in Him should not perish but have everlasting life. “ Believe in Him. It’s not just a vocal belief, or an “I’ll try anything once” kind of belief. It’s faith. As my grandmother said to me, “Pray to God and tell Him you believe Jesus was His Son, and that if you die, you want Him to take you to Heaven.” Full faith in God doesn’t happen overnight. We all grow in faith as we walk with Him. But it all starts with that simple prayer and a simple belief in Christ as His Son, sent to save us. For those of us that have accepted Christ as our Savior, our eternity has already begun. Like the endless circle on the back of that neckless, our live is endless – eternal – as John 3:16 says. While our bodies will die, our soul will never experience death. But for those that have not received Him, the clock is ticking. Jesus says in Revelation 22:10-11 “Do not seal the words of the prophecy of this book, for the time is at hand. He who is unjust, let him be unjust still; he who is filthy, let him be filthy still; he who is righteous, let him be righteous still; he who is holy, let him be holy still.” There’s a time coming when Christ will return and there will be no more choice of Jesus given to those that have failed to receive Him. The righteous, those who have received his atonement for sin, will remain righteous. But those that are unjust, will never be justified. Friends, you have no promise of tomorrow. This just may be the last chance you have to make a choice to receive Christ. Your eternity could begin today.